How many times over your lifetime have you heard “check your work!”? It’s common advice that could have come from your third-grade math teacher or your first boss. Accountants, in particular, must be sticklers for reviewing and checking their work. After all, financial statements are critical to informing investors, analysts, upper management, and regulators. Mistakes in corporate financials could result in errors in decision-making, stock price swings, or even regulatory action. Accountants use disclosure and accounting checklists, and continuously seek out additional tools that provide double-checks on accuracy and completeness. Many accountants now also rely on XBRL US Data Quality Checks – free, automated rules that help filers identify errors in XBRL financials so that corrections can be made prior to SEC submission. And now there is clear evidence that using Data Quality Checks improves the accuracy of financial filings. We’ve checked our own work! Step 3 – XBRL US Data Quality Committee rules, which perform evaluations on the content of the XBRL financial document to test for problems that can result in inaccurate data like incorrect positive or negative values, conflicting dates, or the use of elements that have been “retired” from the FASB’s US GAAP Financial Reporting Taxonomy. XBRL US started the Data Quality Committee in 2015 to help public companies identify and correct errors in their XBRL formatted financials. The Committee, which is comprised of securities analysts, filing agents and issuers, has made these rules available for free to all filers. The Committee believes in the value of “checking your work”. That’s why the Committee has analyzed data pre- and post-implementation of the rules to gauge their impact on the quality of filings. The chart below shows the count of negative value errors across all public companies over time. Negative value errors are situations where a value was reported in XBRL with a negative sign when it should have been positive – one of the most common problems in XBRL filings. What smart accountant would not use a tool that is not only freely available, but proven to catch errors that can be difficult to identify? It’s very revealing to look at the first quarter of each year in the chart (that’s the quarter in which the majority of the 10-K’s are filed, which typically have more reported values and hence, more corresponding errors). The first quarter of 2014 and 2015 have a high level of negative value errors. The first quarter of 2016 and 2017 have a much lower level of errors. This improvement is significant, and can be attributed to the Committee’s rules, which were introduced in September 2015. The same impact applies to the majority of the 10-Q filings, shown as Q2, Q3, and Q4 in the chart. 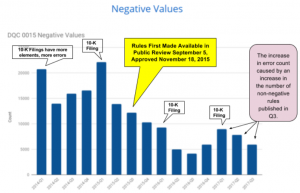 There is a marked decline in the number of negative input errors after the Committee made its rules available for use in September 2015. The Committee published a subsequent set of negative value rules in the first quarter of 2017, to give issuers guidance on additional concepts that should not be negative. This accounts for the apparent increase in errors shown on the chart in quarters one through three of 2017. Clearly, the rules are being used by preparers, and they’re working. 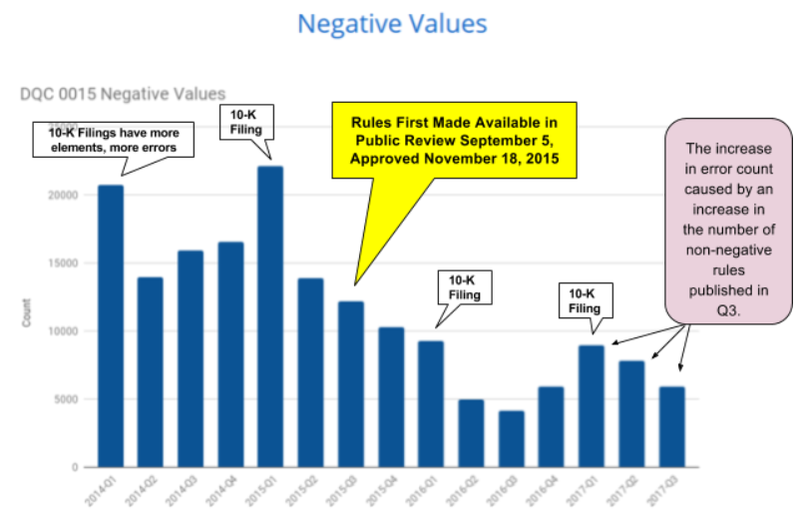 The decline in errors confirmed to the Committee that not only are the rules effective, but they are used by many SEC filers. We know that every public company is not yet using the rules, because, if they did, theoretically the error count would drop to zero. A similar decline in error count was observed for other rulesets covering situations such as axes used with incorrect members, the use of deprecated (retired) elements, and incorrect use of dates. The goal of the Committee is to publish rules for every possible category of errors that can be checked in an automated fashion, so that preparers have an easy, consistent, comprehensive method to catch and resolve common problems. These automated rulesets are free and publicly available. If you’re an SEC filer, is there any reason not to use them? Talk to your service provider to make sure you have access to these rules for your filing. Check out the rules: https://xbrl.us/data-quality/rules-guidance/ . Use a free automated tool to check your own filing: https://xbrl.us/data-quality/check-filing/ .